Search results for "jane jacobs"
Students presenting their work at UCLA's Suprastudio. As architecture schools continue to grapple with new challenges and emerging technologies a major question keeps surfacing: How can architects help design the space beyond the building envelope? 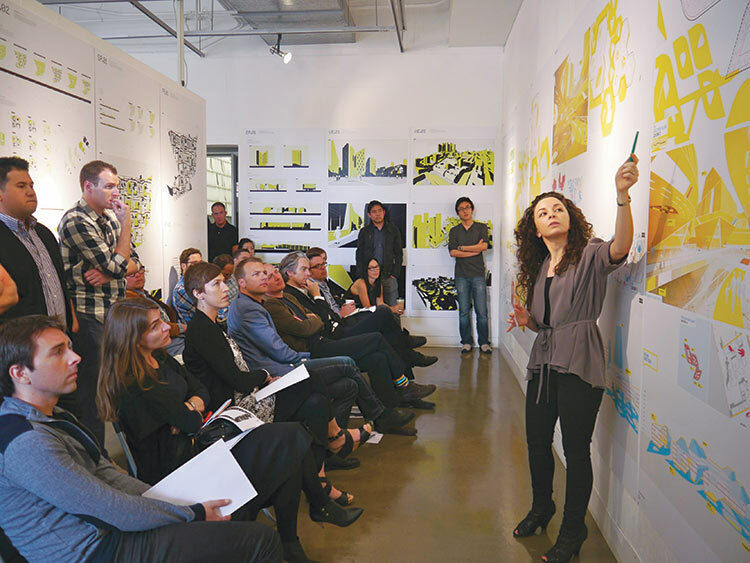 Perhaps the most rigorous exploration has been taking place at UCLA’s MArch program, Suprastudio, an advanced year-long graduate course that examines architecture’s role in the urban environment. 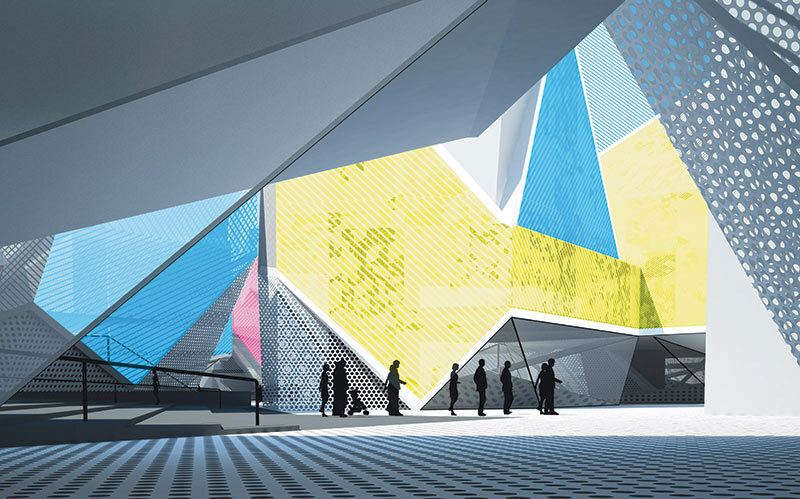 Past studios have been taught by Thom Mayne, whose students evaluated copious data from cities across the country, and by Greg Lynn, who partnered with Walt Disney Imagineering to envision otherworldly new parks and facilities. Project by Adam Lind and Brent Lucy. Over the course of a year Denari challenged teams of students to leave their architectural comfort zones. He asked them to work at a much larger scale than they had been trained for as undergraduates and required them to start their process, not programmatically, but formally, and work backwards. 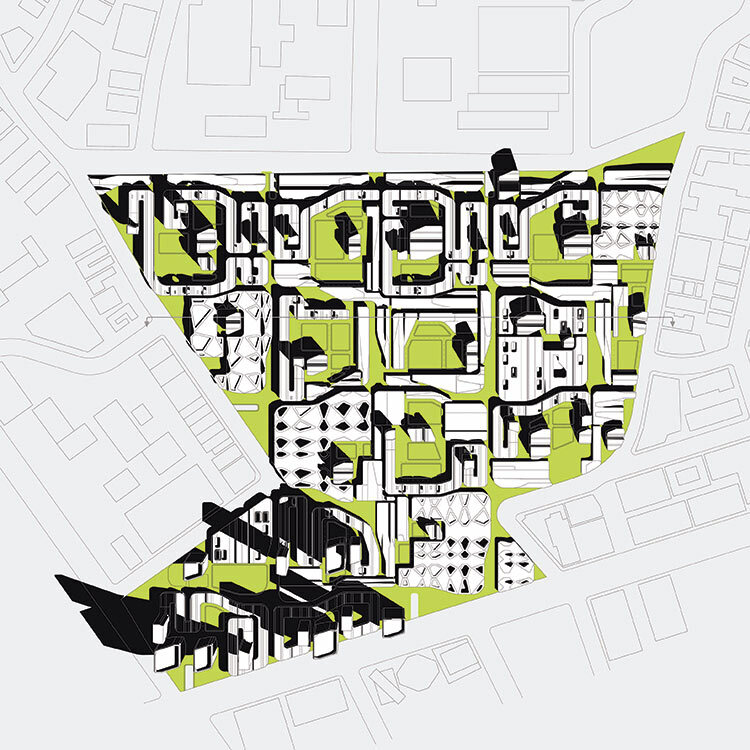 The re-thinking of Westwood took into account major changes like the future addition of a subway station, but for the most part students started with a tabula rasa, filling it with their own graphic and urban interventions. At one review, Denari asked anyone holding on to concepts of piecemeal Jane Jacobs urbanism to leave the room. But this wasn’t an exercise in throwing away integrated planning and the hard lessons that emerged from brutal modernist planning. Students were challenged to form their own perspective and take their own route. Project by Dan Hesketh and Jonathan Nadel. That spectrum included elements as holistic as planning and as detailed as richly saturated graphics. All were carefully integrated to form a new type of urbanism that was neither organic nor modernist. The results were new neighborhoods that were all outside the mainstream of conventional urban thinking. 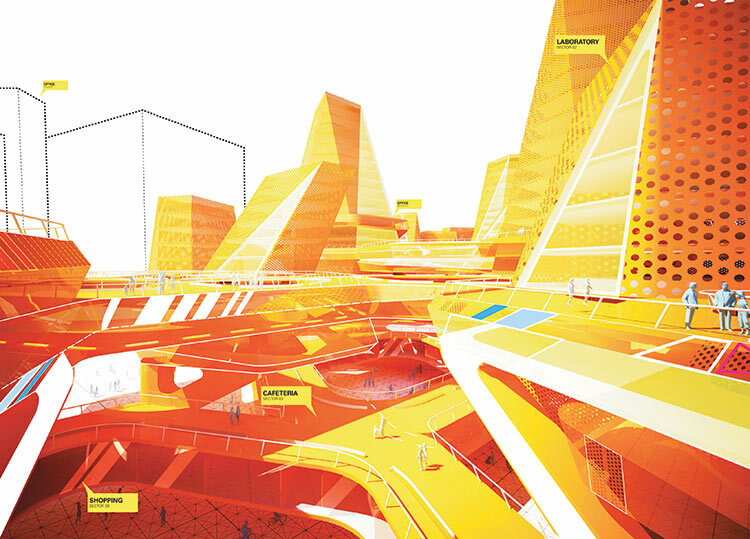 Daniel Hesketh and Jonathan Nadel’s project Remix City focused on creating what Hesketh calls “endless possibilities.” In other words, it included as much urban and architectural variety as possible using the least resources. 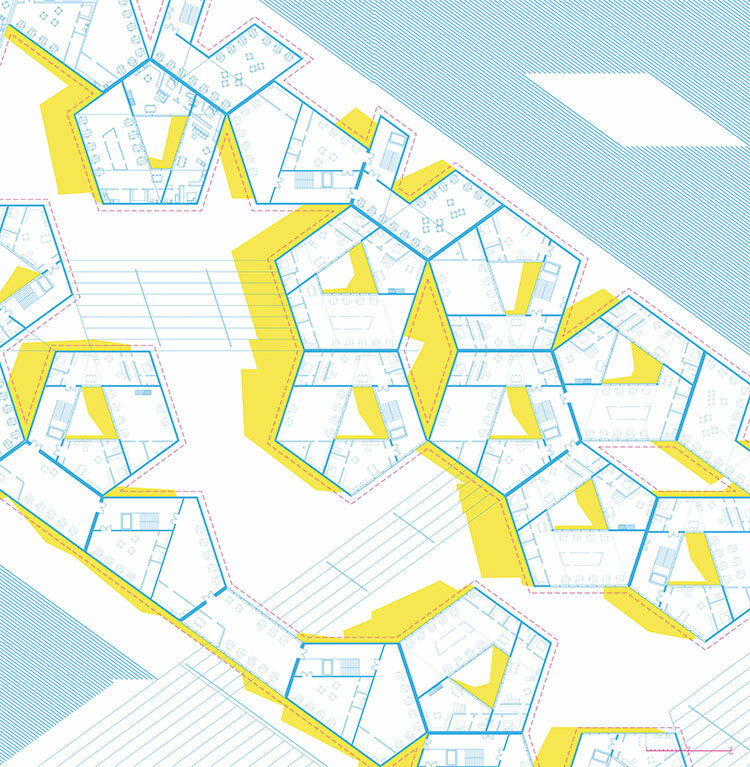 Building modules were repeated, but in rotated or mirrored configurations across the site. The pieces, in turn, were suited to varied programs and scales, but always emphasizing fine-grained, pedestrian-oriented activity, despite the large scale of building. We didn’t want to fall into the trap of monumental scale or non-human plazas,” he said. Project by Jonathan Gayomoli and Ryan Ramirez. Of course the floundering was a big part of the course’s challenge, according to Denari. “If you’re operating with guarantees and securities we can’t really find something. Generally I try to operate that way,” he said, adding that the course’s year-long format allows plenty of opportunities for students to make mistakes, get frustrated, and eventually have things fall into place like puzzle pieces. Project by Jonathan Louie, Lilit Ustayan, and Chi Zhang. 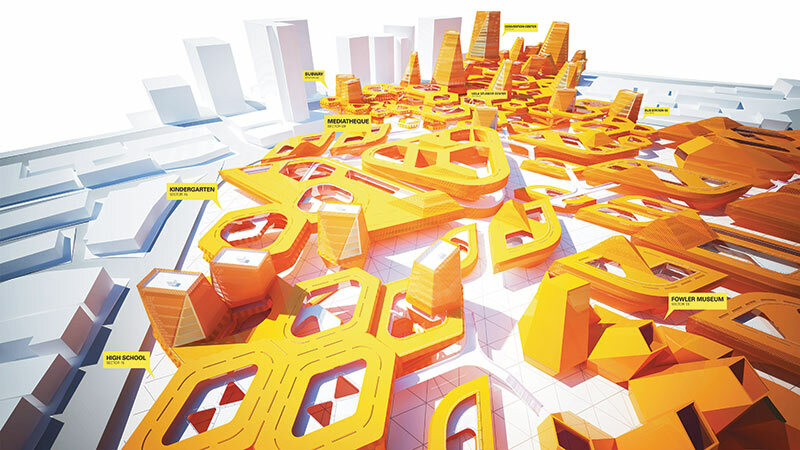 Lilit Ustayan, Chi Zhang, and Jonathan Louie’s project, The Continuous Environment: Applications on a 3D City, started with Westwood’s grid and investigated what form it would take if the automobile were no longer the major means of circulation. 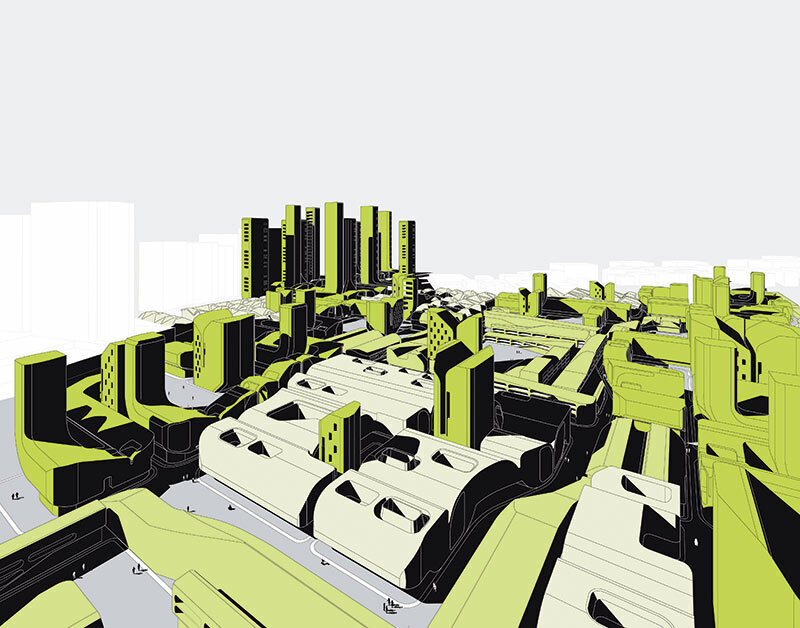 Closer to Wilshire Boulevard, the project was about intricate interconnection, with pedestrian passages and smaller, more fragmented building forms. As one moves north toward the campus it became more block-like with bridges connecting eroded and coiled buildings. Rendering of proposed plan for SPURA on the Lower East Side. Forty-five years ago, when the lots on the south side of Delancey Street in the Lower East Side (LES) of Manhattan were first cleared for “urban renewal,” the prevailing planning theory called for “towers-in-the-park.” Indeed, that was what was installed slightly south and east of the site: one of the many bastardizations of Le Corbusier’s Plan Voisin for Paris. To the north and west, the landscape of low-rise walk-up tenements largely remained. 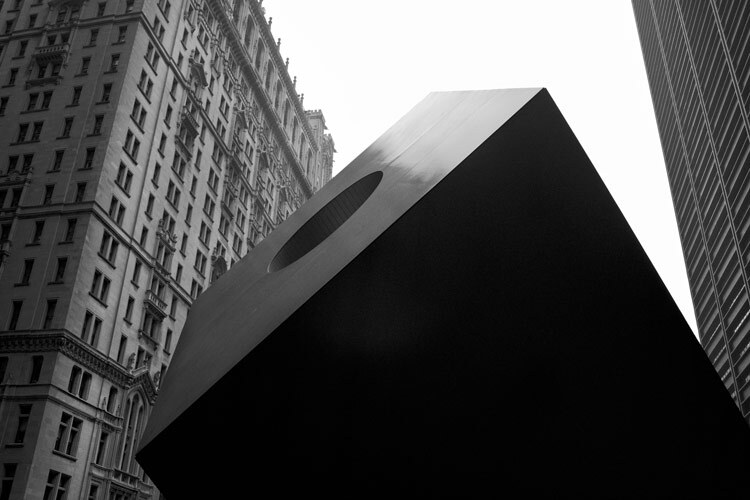 In between them is a hole, the black hole of the Lower East Side. If you arrive by the Williamsburg Bridge or emerge from the Delancey Street subway station, look south and you’ll see entire vacant blocks occupied mostly by parked off-duty delivery trucks. This site, the Seward Park Urban Renewal Area (SPURA) has a long and contentious history. And finally a plan for its redevelopment is near approval. 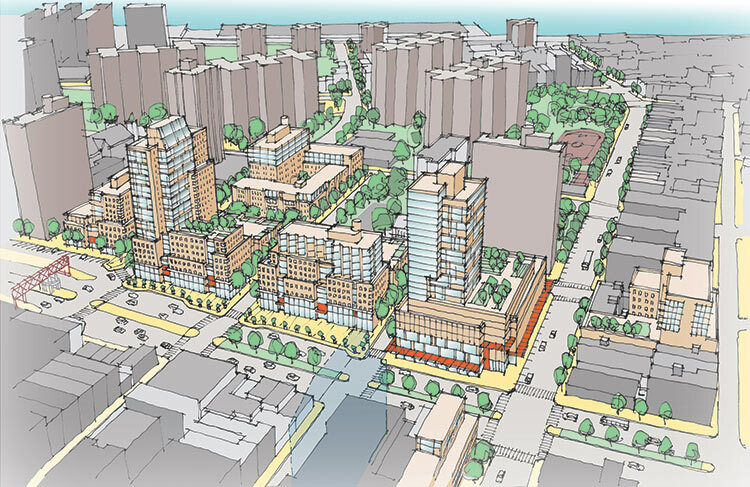 Community Board 3 and the City Planning Commission both recently gave the go-ahead. Community groups and elected officials fought hard for a primary need of the neighborhood: affordable housing. Reaching a successful accord on that, though, seems to have distracted attention from the two disastrous backbones of the plan, both of which rely on old school ideas of urban renewal and zoning. Even more frustrating, newer enlightened policies are being promoted by the city’s planning department, while the outdated and discredited ones are still retained by another city organization which happens to be SPURA’s owner, the Economic Development Corporation (EDC). The EDC policy derives from the continued presumption of the primacy of cars. A basic tenet of what’s known as transit-oriented development involves restricting the amount of parking in order to both discourage driving and congestion, and to free up funds and land for other, more valued uses. But the EDC insists on pursuing the opposite track: requesting an exemption to provide additional parking spaces beyond what the current—yet to be updated—zoning allows. With the confluence of mass transit and existing density around the site, there is no justification for this outdated approach. (Please recall this is from the agency that brought us the white elephant of a parking structure sitting empty at the new Yankee Stadium.) People do not come to the LES by car to shop. Nor should we want them to. Delancey is already one of the most dangerous and difficult streets to cross in the city. While the city is in the midst of some safety improvements following a rash of fatal accidents, adding parking and traffic will just worsen the situation. 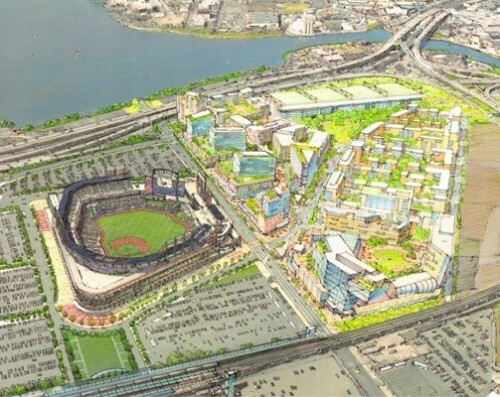 There’s an even more significant flaw in the EDC’s master plan. Though it’s informed enough, thankfully, to avoid repeating the street life-draining nearby towers, it doesn’t really get that it’s not just a matter of building to the street line. In the 1970s and 80s, the low-rise sections of the LES might have been mistaken for some of the worst areas of the South Bronx, replete with trash-filled vacant lots and burned out shells of six-story walk-ups. In the following 20 to 30 years, the neighborhood picked up dramatically, coat-tailing on the bubble economy. Unlike some other Manhattan neighborhoods, the Lower East Side managed its mini-boom fairly gracefully, at least at first. Abandoned walk-ups that no longer had stairs to walk up were gutted and repopulated. Some of the vacant lots were “infilled” with new buildings similar in height to the adjacent survivors. Yes, gentrification took place, but there was a bit of a difference here from the typical pattern. Because of a combination of tenant protection rules and the availability of vacant space, the gentrifiers (myself included) often ended up meshing into the existing fabric, which, in turn, was strengthened with newly infused economic vitality. It wasn’t a perfect evolution, to be sure. But the LES became a rare example of change without upheaval and, aside from the inevitable issue of rising rents, few questioned whether it was an improvement over the previous decades. Things started to change in the mid-2000s. High-rises began to appear. Not on the city-owned SPURA parcels, but on nearby privately-owned property where developers had bought up the air rights from the surrounding low-rise buildings, and then stacked the accumulated floor area into heights that were far, far above the existing walk-ups. Several of the new towers were hotels, which frequently hosted raucous—often open-air rooftop—parties. One could actually make an argument, unpopular as it might sound, that these towers are not the worst possible form of development for the LES. Concentrating the allowed construction into these small parcels has had the unintended side effect of preserving the majority of the adjacent older, smaller buildings. 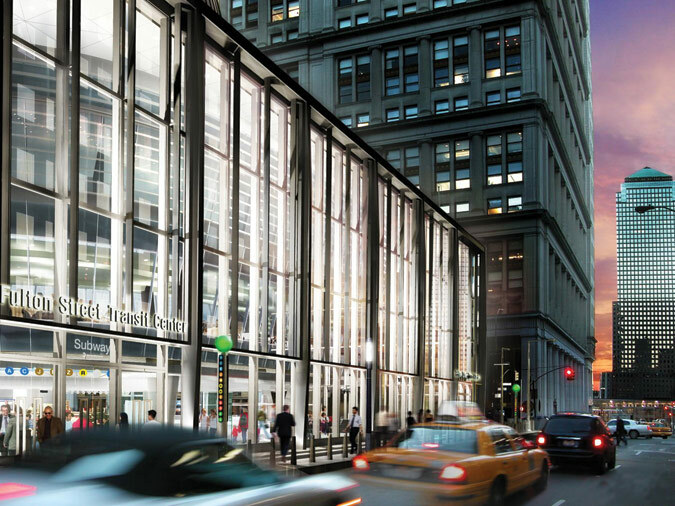 Since they have sold their air rights, there is little incentive to tear them down to rebuild—the new buildings could not be any larger than the existing ones. In an odd way, the result is an urbanized version of the tower-in-the-park, except that the “park” is the existing fabric of the neighborhood. The EDC—which in other undertakings is very supportive of local business development—is insisting on the inclusion of big-box space in SPURA, claiming they are required in order to “anchor” the shopping district. Never mind that the LES is a community, not merely a shopping district. The term anchor store comes from the world of shopping malls. But that approach doesn’t apply in an urban situation where the customers are already there and therefore don’t have to make the decision to travel a longer distance. Increasing density in built areas is practically a given in planning circles. For a number of years planners and policy makers have emphasized smart growth, new urbanism, and now transit-oriented development. In general this logic is accepted as good policy. However, density is a positive factor only up to a point. Once a city or a neighborhood has achieved a density sufficient to support local businesses and mass transit, adding more to it does not bring additional benefits. It’s the backside of the diminishing returns curve where, really, the only ones who gain are property owners who can sell out, the developers who come in, and city governments that stand to reel in more taxes. There is a subtler aspect to density and it is a major determinant of the quality of a community. It’s what urban theorist Richard Florida and others have started calling “Jacobs density,” named after Jane Jacobs, and what has also variously been called the “Popsicle test,” the “twenty-minute neighborhood,” and the “pub shed.” The counterpoint to Jacobs density is “crude density,” where the mere presence of tall, densely-packed buildings does not automatically create vitality or spur creativity and innovation. New Urbanist and architect Steve Mouzon refers to “walk appeal,” arguing that neighborhood quality is defined not just by how close services and amenities are, but by the appeal of the walk to get to and between them: Are you walking through a parking lot or an inactive street or sidewalk versus a streetscape full of things to see and do? The LES is decidedly past that point of diminishing returns. Our sidewalks, streets, subway stops, and buses are not wanting for more people. Stores, for the most part, do not lack customers. Like virtually all of Manhattan and many parts of the outer boroughs, the LES has all the density and more that’s needed for a vital urban neighborhood. Except, that is, in the blocks comprising SPURA. Mending the fabric of the LES by filling that half-century hole is wholly desirable. What’s not desirable is turning it into another version of Broadway on the Upper West Side or into a generic “modern” street you might find in any number of other cities. But that’s what the plans for SPURA endorse. Looking at the renderings, which admittedly are not specific architectural proposals, you see block-long masses that could be dropped in anywhere. And that’s precisely what the LES does not need. You won’t find many chain stores in the LES. Few bank branches have opened. There’s a refreshing paucity of Starbucks and Duane Reades. Those are about the largest stores here, with the exception of Whole Foods, which occupies the entire ground floor of a post-millennial complex not unlike the ones envisioned for SPURA. The wonderful thing about an urban street is the activity. That’s understood and accepted by all, it seems, except developers. There’s a vibrancy in seeing the unexpected or bumping into your neighbors. But the level of street life outside a long row of Bed, Bath & Beyond or Home Depot windows is nothing like what occurs where you have a different storefront entrance every 20 feet or so, where the owner hangs out and knows what’s going on in the neighborhood. The atmosphere in our tiny local pharmacy—where they know us and come out from behind the register to greet our dog—doesn’t compare to the antiseptic and Muzak’ed Rite Aid a few blocks away. Some will say that discount retailers provide a service: more goods at lower prices. But that’s often an illusion, particularly when the big box forces locally owned stores out of business, causing the neighborhood to lose not just flavor but jobs and income as well. Never mind what happens when the discount chain’s distant office decides that the branch isn’t making quite enough profit and closes it, leaving a desolate stretch of unoccupied street, now with no shopping alternatives. Urban blocks can withstand and absorb a closed storefront or two when there are ten others still open. When a block-long store shutters, so does the life of the street. Cities thrive on that life, or fail without it. Neighborhoods thrive on their individual character, not on imposed generic developments with mega stores. Community Board 3’s resolution approving the SPURA plan understands this. In their “Conditions of Approval,” in addition to sections regarding affordable housing, the beloved Essex Street Market and other neighborhood needs, they strongly oppose big box stores. And their appended guidelines specifically restrict the location and size of “mid-box” stores and promote local service and convenience stores on the narrower streets. But these are only guidelines and the EDC proposal, the one recently approved by the planning commission, does not appear to embrace them. Their vision for filling the LES’ black hole, in its bland suggested form and massing, and with its anti-urban emphasis on parking, has nothing to do with the nieghborhood. It defies current precepts of urban design and place-making. The next step in the approval process is the City Council, where the plan first goes through a committee and may emerge for a vote in November. This means it’s not too late to recognize the shortcomings of the proposal, while retaining the hard-won agreements on affordable housing. It’s not too late to make something that doesn’t merely fill a hole, but builds upon and strengthens the character of the LES. It's been quite a year for architecture critic Paul Goldberger, and almost as dizzying for his readers as for him. But the The New Yorker's loss has turned out to be Vanity Fair's gain, giving the glossy additional gravitas. Now the National Building Museum has added Goldberger to its illustrious roster of Vincent Scully Prize winners. "I don't know that I'll ever be on another list that includes Prince Charles and Jane Jacobs," Goldberger said in a telephone interview. The speech he plans to deliver at the museum on Thursday, November 15th will hit on themes that many in the profession have been mulling over for the course of this tumultuous year in the architectural press: the state of architecture criticism, the changing role of mainstream media in a digital world, and the rise of citizen journalists. "It's a paradox about the great degree of interest in architecture and yet a diminishing amount of outlets," he said, wondering out loud whether the buzz in social media is the equivalent of what is being lost in the general media. He added that it's a complex issue when a mass of voices drown out the opinion of the specialist. "There is a profound value to expert guidance," he said. 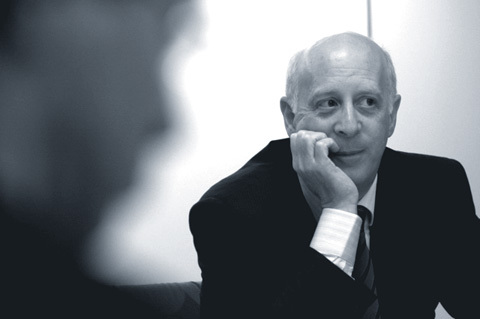 The very heart of his career is based on sharing architecture with a mass audience in an unpretentious manner—and Goldberger, an avid Tweeter, said he wouldn't consider reversing course. "My whole life has been trying to communicate to a broader general audience; that's the most important thing of all to me," he said. "But I feel that things have gone too far—crowdsourcing doesn't always bring you where you want to be." He paraphrased literary critic Daniel Mendelsohn, saying the critic's first allegiance is to his subject and not his readers. 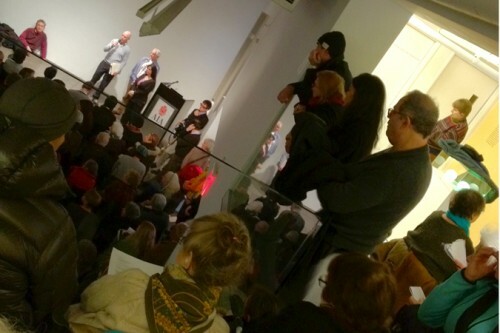 "In other words he's not interested in crowd pleasing," he said. Goldberger didn't shy away from addressing the fascistic dangers of applying the same theory to architecture as to criticism. Nevertheless, the tendency to crowdsource architecture, like crowdsourcing criticism, creates a cacophony, not a vision. "Democracy is a great thing but it doesn’t always lead to the best architectural decisions," he said. "Committees can make things happen, but they can't create works of art." Despite the Motor City’s notoriety as a symbol of urban decay, development is actually going on in Detroit. And with almost 40 square miles of vacant land, Detroit has the chance to redefine urban renewal outright. The city recently took note of one major way some residents are turning blight into bounty: Mayor David Bing signed off on Michigan State University's plan to seed urban agriculture in Detroit with $1.5 million over the next three years. 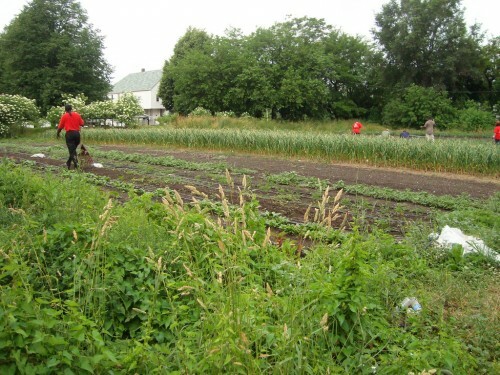 There are scores of farms and gardens already operating within the city. D-Town farms, Eastern Market, and Earthworks are among a network of urban agriculture outfits growing tons of produce within city limits. This has been going on for some time, but MetroFoodPlus—the name proposed for MSU research center—represents an unequivocal municipal endorsement of activity still prohibited by zoning. Entrepreneurs like John Hantz hope to help put thousands of vacant parcels back on the tax rolls and recast Detroit’s infamous depopulation as a unique asset. Hantz hopes to acquire 300 acres on the city’s East Side, though his dream is 10,000 acres. He may find a helping hand in MSU’s innovation cluster. Their agreement with the city is short on details for now, but its stated goals are ambitious: to turn Detroit into a global hub for food system innovation. It is the right time to read architect and historian Sharon Haar’s book on the rich, fraught relationship of universities and the cities they live in. We are in one of the great eras of university expansion. Whether it is the new Yale in Singapore, New York University in its own backyard, or the burgeoning institutions in China, the university is as close to the heart of our current cultural and economic aspirations as it has ever been and the buildings are there to prove it. As financial analysts put it about the economy, a correction is possible—the ranks of dissatisfied, underemployed university graduates are legion across continents. Yet short of a new, harsher recession, the build program will go on, the better for select universities to stand out in a crowded field. And that crowded field is urban, because whether they still have a big green lawn or not, the majority of new and expanding campuses are in cities, and to Haar, it is time to demonstrate that the “urban campus” is a rich opportunity, not the poor relation of the bucolic tradition of colleges in the country. She sees value in this—believing that the university and the city have the capacity to be profoundly and productively connected, but that while the physical form matters, it has to be understood as a larger history of place. Today’s debates on the future of campuses in American cities—take New York University (NYU) in Greenwich Village, for example, where community opposition has been bitter—are informed by history, yet they often lack a framework for understanding the full complexity of what cities and universities have to offer each other. How much does it matter if a campus is “porous” or not? How can we align the priorities of the university—research, teaching, and service, in that order—with the values of a city? These questions have a history, and we’d do well not to repeat it. 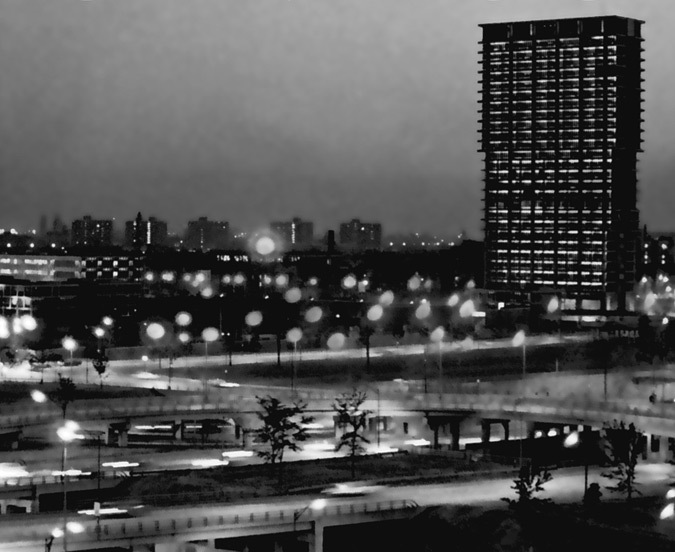 Haar grounds her work in the close study of her subtitle, “Urbanism and Higher Education in Chicago,” but also frames it in terms of larger American patterns. An architect by training, she analyzes the evolution of a very specific site, the University of Illinois at Chicago (UIC), a paradigmatic 1960s urban campus (first built as the University of Illinois at Chicago Circle Campus). She reviews both the evolution of the formal character of that design by Skidmore, Owings & Merrill’s (SOM) Walter Netsch, who came to the commission fresh off his triumph at the United States Air Force Academy, and the tense backstory of the release of the original master plan and the political protests that ensued. Her core research begins with the program and form of the turn-of-the-century Hull-House Social Settlement, most of which was knocked down or relocated to make way for the new university. She then moves on to the recent era when SOM’s distinctive skywalks and rooftop forum, were, in their turn, demolished as outmoded relics. Her deep “section” of the campus’ blocks, super and normal, is a compelling approach to uncovering the complexities of how we occupy cities, in which one generation has college-educated women living side by side with an impoverished immigrant community in Hull-House as an exercise in urban reform and social work. Two generations later a new generation aims squarely at providing another idealistic, if imperfect, reform, by expanding university education to a broad swath of the city’s population. Haar includes a welcome review of thinking about campus design, from Paul Venable Turner’s estimable Campus: An American Planning Tradition (1987) to Thomas Bender’s inspiring notion of a dynamic give-and-take between university and city (in the same vein as his enthusiasm for the public intellectual as described in New York Intellect ). Haar’s thesis is that the urban campus should not model itself as an enclave, but should be “imbricated” with the city, with forms and programs overlapping. Beyond UIC, she draws attention to the range of new campus types in Chicago, from downtown’s compact and vertical “Loop U” of recycled office buildings and new construction to OMA’s elevated-train-line-wrapping McCormick Tribune Campus Center (2003) at Illinois Institute of Technology. In writing about Chicago as a living museum of university design, the burden of the task Haar has set for herself is sometimes evident. You can’t, she argues, fully understand Chicago’s campuses unless you understand, for example, how Chicago’s universities developed the very concept and practice of urban ecology. Haar is not just writing about campuses, but about the whole way that universities engage the city. She writes, “Higher education is not in the United States, commonly understood as an urban spatial practice.” She aims to change that understanding, through her own approach to theory and fieldwork, and it is not a task for the meek of purpose. Neither is building a new urban campus. Most city administrations actively support university expansion, seeing it as critical to their municipality’s prestige and competiveness. Neighbors, however, often protest, finding little common purpose with the institution in their midst in terms of scale and activities, programmatic differences detailed by Jane Jacobs with a vision still potent 50 years after it was articulated. Campuses are also, in some communities, challenging due to a fundamental socioeconomic asymmetry. University education is vastly more democratic than before, but it is not universal. There are opportunities for a common mission, however, and Haar’s volume contributes mightily to our knowledge of what has been and might be. She ends the book with a chapter on the implications of the largely still unbuilt proposals by Harvard, Columbia, and NYU. While she holds off on directly critiquing those proposals (quoting adamant critics such as Columbia’s Mark C. Taylor instead), she proposes unequivocally that “this is the moment to reconceive the campus not as a discrete community set apart from others but as an urbanity capable of engaging both new forms of cities and city living brought about in physical and virtual space.” But, she avers, this is a case for what should be, not necessarily what will be. In looking at urban campuses in the United States and abroad, it is clear that universities, and the administration, staff, faculty, and student body that occupy them, are still powerfully drawn to the symbolism of the enclave, and to the formation of the “discrete community” that goes with it. It is time for further research, and no doubt Haar is already on it. For the future of the campus, knowledge is a two-way street. Don’t expect it to be an easy drive. One of Jane Jacobs’ most valuable contributions to the understanding of cities was her faith in the wisdom of the urban dweller. She argued that the physical city—and any approach to city planning—could not be separated from the wisdom of each individual inhabitant, “People who know well such animated city streets will know how it is. I am afraid people who do not will always have it a little wrong in their heads, like the old prints of rhinoceroses made from travelers’ descriptions of rhinoceroses.” The complication arising from Jacobs’ argument is simple though difficult to solve; how can we plan a city when planning is one part abstraction and abstraction removes us from Jacobs’ precious “real life” mentality? A step towards solving this contradiction is sfbetterstreets.org, a website launched last week by the City of San Francisco. Developed by the San Francisco Planning Department in conjunction with other city agencies, the website is part of the city’s larger, “Better Streets” initiative. The legislative concept, described in San Francisco's Better Streets Plan, is to create streets “designed and built to strike a balance between all users regardless of physical abilities or mode of travel… maximizing features for the comfort, usability, and aesthetics of people walking.” Many cities have made strides to improve the everyday experience of urban dwellers; PlaNYC in New York is an excellent example. Unique to San Francisco’s approach though—encapsulated in the “Better Streets” website—is an emphasis on direct citizen engagement through the provision of necessary tools for engaging city government and the community. The website empowers individual citizens and associations to change their streets by including ideas for street improvements, accessible descriptions of necessary permit processes, and suggestions for building community support. On the page for each specific street improvement, a small box entitled "Agency who can help" provides access to further information on how to request a specific street improvement. Sfbetterstreets.org is best understood as city-supported citizen engagement. When the New York City Department of Transportation created a website to solicit crowd-sourced suggestions for locating stations of the upcoming Bike Share program, it received over 70,000 votes from interested members of the public. San Francisco’s “Better Streets” outreach is an important example of how to harness the public’s interest in shaping city planning. Although a city-led initiative, “Better Streets” taps into the city itself, acknowledging what Jane Jacobs believes to be the most knowledgeable voice in the city: the people themselves. Time was, if you were interested in becoming an architecture critic, you read the work of other critics, gleaned what you could from it, then set out to develop a voice of your own, a process that generally involved both imitating and contradicting your predecessors. 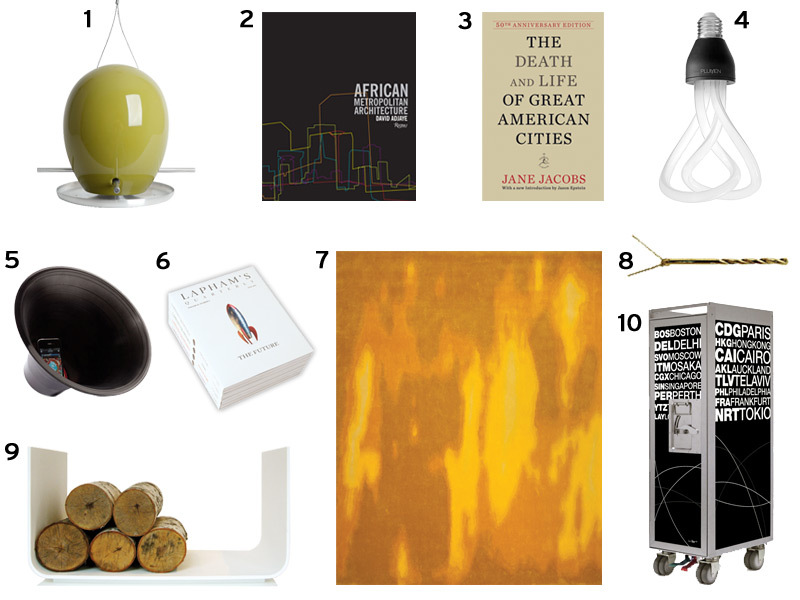 If you read any books that could be classified as architecture criticism they were almost surely collections of a single critic’s work that had been assembled between two covers as a hedge against the brief shelf life of newspaper and magazine articles in a pre-Internet age. So it should not be that much of a surprise that Lange has written a different kind of architecture criticism book, not an anthology of her own or any other single critic’s writing, but what amounts to a textbook. Writing About Architecture: Mastering the Language of Buildings and Cities is a how-to book for a profession that has never, so far as I know, had one before. It is based roughly on Lange’s course, and it is organized around six significant pieces of writing (appearing in full) that she believes have particular value as object lessons. Lange selected some of my favorite pieces of writing to use as her paradigms, including Charles Moore’s essay of 1965, “You Have to Pay for the Public Life,” which might be called the beginning of the important academic discipline of Disneyland Studies, and which for me ranks as one of the seminal works of architecture criticism of the second half of the twentieth century. There is also a pair of excerpts from Jane Jacobs’ Death and Life of Great American Cities, the book that set in motion nothing short of a sea change in its field. 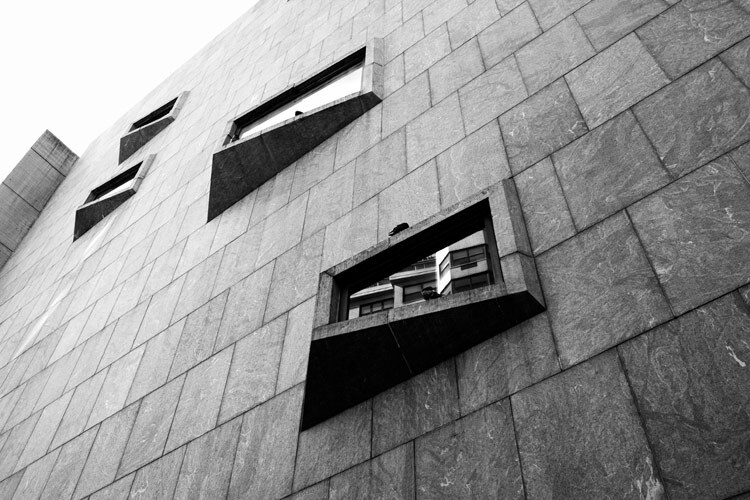 Lange also devotes chapters to typical, but absolutely first-rate, journalism in the form of reviews by Lewis Mumford on Lever House, by Ada Louise Huxtable on the 140 Broadway skyscraper and by Michael Sorkin on Michael Graves’ ill-fated plan to expand the Whitney Museum. She focuses another chapter on Herbert Muschamp’s remarkable, intensely personal essay on Frank Gehry’s Guggenheim Museum in Bilbao, Spain; and one to a paper by Frederick Law Olmsted, “Public Parks and the Enlargement of Towns,” from 1870, as a way of bringing landscape architecture into a broader discussion of urban public space. With Mumford, Huxtable, Jacobs, and Olmsted, Lange is giving us what we might call the canon of architecture criticism. I might have tossed a bit of the late-nineteenth century critic Montgomery Schuyler into the mix; though his writing wasn’t exactly breezy—he was to architecture criticism as Henry James was to the novel—Schuyler pretty much invented the notion of architecture criticism as a part of journalism. He was a key early advocate of the skyscraper, a subject Lange devotes two of her chapters to, so it’s odd to see him not even make the index. She does refer to a number of other critics in the essays sandwiched between the major texts (Full disclosure: I am one of them, and my review of Norman Foster’s Hearst Building is contrasted with other skyscraper reviews) and so the book is by no means limited to her six anointed authors. But neither will it give you a broad sample of either contemporary or historic architecture criticism. Writing About Architecture is what it says it is: a how-to book. Lange analyzes her key texts with great care and perceptiveness, and happily she is wide ranging in her taste. She seems as comfortable explaining Muschamp’s intensely idiosyncratic criticism as Sorkin’s indignant yet elegant and erudite rants, and she discusses them both with sympathy and intelligence. At the end of the day her heart clearly belongs to Ada Louise Huxtable, but then again, what architecture critic’s doesn’t? If there is a problem with this book, it emerges out of the limits of the textbook genre, which seems inevitably to encourage authors to classify and categorize. Lange declares Sorkin an activist critic and Muschamp an “experiential” one. She says that Huxtable and Mumford are focused primarily on “the form of the artifact,” and that yours truly organizes reviews “the man, not the building.” That may be a fair enough conclusion to reach from the pieces she cites, but none of the critics Lange discusses in detail can, or should, be pigeonholed. Huxtable is an activist critic and an experiential critic; she is also a critic who uses history, and a critic who writes with an awareness of social, political, physical, cultural and personal context. Sorkin is more than an activist critic, Muschamp was more than an essayist about private architectural experience. And so on. Lange understands that the purpose of writing about architecture is to build a constituency for better design, to help people see, to help them feel some agency over the built environment—and to help them take joy in architecture’s great moments. She’s good at doing that herself, and this book will help others do it, too. In Fitzgerald's Great Gatsby the billboard eyes of Doctor T. J. Eckleburg kept watch over the ash heaps near Willets Point. For the past four years Mayor Bloomberg has had his eyes steadfastly fixed on the site and it looks as though he may realize his vision of the area as a mixed use development. Today Crain's reports that a key part of the redevelopment plan, ramps connecting to the Van Wyck Expressway, was approved by the Federal Highway Administration. In Gatsby, the area served as a brutal reality check between Gatsby's West Egg fantasy and the glitz of the Plaza Hotel. For urbanism buffs a trip to Willets Point is a must. The many auto repair shops, junk yards, and recycling plants provide an unfettered look inside the belly of the urban beast. But like so many other dirty bits of business (see Fresh Kills), the city seems intent on exporting the unattractive aesthetics that come with it. "It may not look pretty, but its work that needs doing," said Roberta Brandes Gratz, author of The Battle for Gotham and Jane Jacobs protege. "If it's not clean work, does that make it blight?" Gratz compared the city's plan to Robert Moses' neighborhood clearance projects. She questioned the elimination of businesses that pull in more than $1 million in real estate taxes, despite being unconnected to basic services such as sewer and waste water systems. "It costs the city nothing, yet its collecting tax revenue," said Grantz. "Where are those businesses going to? Jersey, Connecticut, Nassau?" There's no questioning that the city has begun to appreciate its decayed industrial aesthetic, so lovingly and nostalgically preserved on the High Line. The city has even found ways to reclaim former trash heaps (see Fresh Kills again). A statement from New York City Economic Development Corporation frames the Willets Point project in similarly ambitious terms: "Building upon the off site infrastructure work on which we broke ground last fall, today, we are literally laying the foundation for the site and unlocking its long-term potential for future generations of New Yorkers." But the gritty industries that created the sites may not be as welcome in future plans. Instead, $3 billion worth of hotels, residences, and retail along with nearly 80,000 vehicle trips a day will take their place. "Adding new highways is no longer considered reasonable and an off ramp will increase traffic," said Gratz. "What ever gets built there would car oriented. I thought the city was trying to be green!" 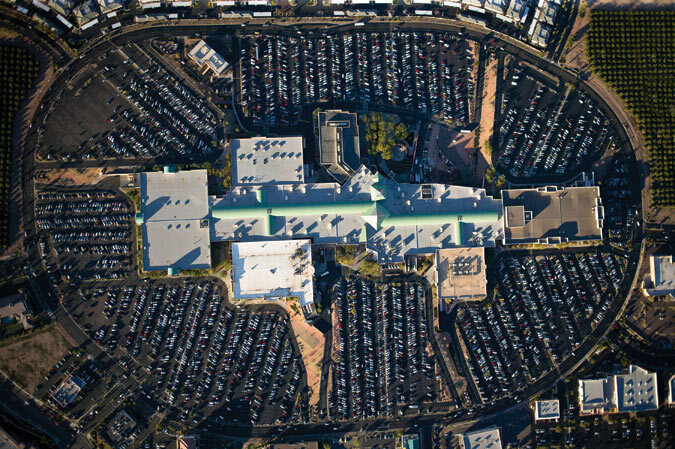 Arrowhead Towne Center mall in Glendale, AZ. The reality in retail for the past few decades has been a slow drain on Main Street as big-box stores siphon off shoppers leaving smaller venues to fend for themselves. Today the picture is even more complicated, with malls and mom-and-pop stores both struggling. With different agendas and tactics, government and developers are now both trying to shape retail in ways that will preserve urban character while growing the economy. Tom Stoelker grabs a shopping cart. To drive up Broadway in New York is to stream past armies of smiling muliculti faces projecting the images of self-satisfied cell phone users, happy drugstore customers, and shoppers on a tear. And that’s not even the people on the sidewalk; it’s the larger-than-life advertisements featured in the chain-store windows proliferating where once neighborhood hardware stores, boutiques, and grocers were the norm. Main Street retailers have been in a protracted fight to the finish for years now, with big-box retailers and malls bearing much of the blame. Now Manhattan’s mom-and-pop stores face the same destiny as the drugstore soda jerk as chain stores cannibalize two, three, and sometimes four or five consecutive small storefronts to satiate a need for more and more square footage. And then there are the banks, with Bank of America’s blazing red blurring into TD Bank’s emerald green, while Chase’s blue glow blends with Citibank’s cobalt. And this isn’t even honky-tonk Broadway at Times Square; it’s the Upper West Side. As signage and ads envelop entire storefronts, creating sidewalk-level billboards, they are gnawing to nubbins any remaining sense of neighborhood character. Retail repetition on Manhattan’s Upper West Side. Retailers—both large and small—are caught in a Catch-22. Today’s urban customer wants small shops and a homespun product while demanding the convenience, variety, and price that only the chains can offer. Mom-and-pop stores have the right look but not the economy of means to succeed without governmental intervention in the form of zoning. Large-scale developers are trying to solve the problem by curating retail experiences to appear more local, and on occasion even subsidizing rents for smaller shops. Fashion chains on Bleeker Street. Last month, New York’s Department of City Planning attempted to address the community concerns on the Upper West Side through frontage limits. “The goal is to preserve and restore multi-store frontages,” City Planning’s Laura Smith said at a crowded community meeting. “Banks deaden the streetscape.” With its residential side streets, the Upper West Side relies on the north/south corridors of Broadway, Amsterdam, and Columbus for shopping. The proposed “enhanced commercial district” along Amsterdam and Columbus would require two storefronts per 50-foot lot with no store exceeding 40 feet. While existing businesses would be grandfathered in, new banks would face the most stringent regulations, with a store frontage limited to 25 feet. How tenants expand beyond a minimum 35-foot depth is up to them. The intention is to encourage an upstairs or downstairs expansion rather than the current street-level proliferation. Plenty of cities, indeed plenty of New York City neighborhoods, would envy the Upper West Side’s problems with its 6 percent vacancy rate. Certain areas of the Bronx would welcome any banks and chain stores, if only they would come. American Dream Meadowlands, formerly Xanadu, now under construction. Retail regulation by government is taking hold elsewhere and in different shapes. In New Jersey, for example, government influence over retail is coming in the form of state funding and tax breaks for big developments. Two mega projects under construction took in huge influxes of public as well as private capital. Both are using Vegas-style strategies to attract retail consumers, stressing the entertainment angles. 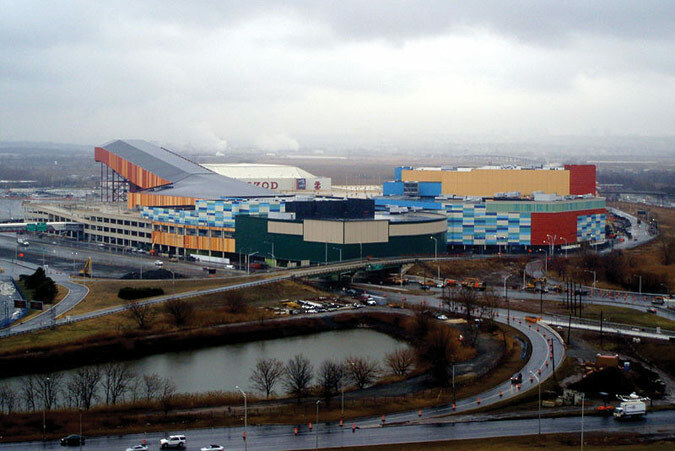 The Revel casino in Atlantic City is a 6.2-million-square-foot retail behemoth that calls itself a “beachfront entertainment resort,” and American Dream Meadowlands will be a 7.5-million-square-foot “retail entertainment complex,” not a mall. Both ventures were on their deathbeds until the state stepped in last summer. Revel got $261 million to complete its $2.4 billon project and American Dream got $350 million in tax breaks for its $3.7 billion project. 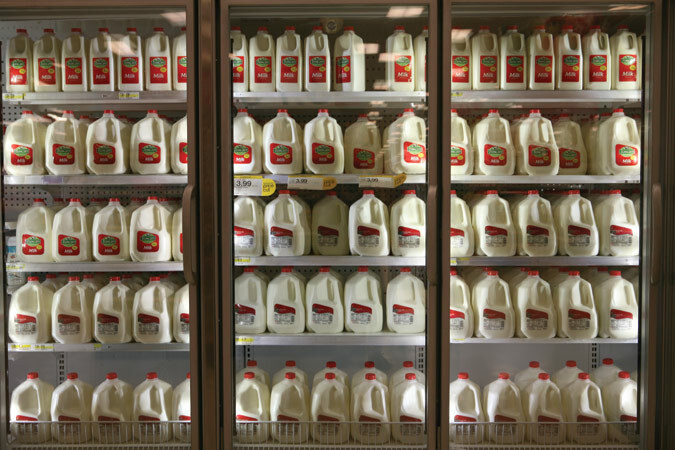 Milk on sale at Target. The website of the American Dream touts the need “to capture consumer disposable income throughout all types of economic cycles […] as a world-scale tourist magnet.” Revel, however, has reached out to regional foodies by bringing in a host of culinary talent from New York, Washington, and New York. But across major cities in North America, retail regulations vary widely. San Francisco arguably has some of the most restrictive laws limiting retail uses, despite the fact that the zoning of interiors can stir up issues of free speech, as well as state and federal jurisdiction. (A handy ruling from the California Supreme Court does say that states can use zoning to regulate for aesthetic reasons.) The San Francisco law limits “formula retail stores” in “noncommercial districts,” which is to say it limits chain stores from expanding into residential neighborhoods. If a store has more than ten stores nationally, it’s considered a formula retail store. Even Pet Food Express, a locally owned holistic pet food store, faced push back. Aisles and aisles at Target, Riverdale, Bronx. At the other end of the spectrum is Toronto. Rollin Stanley, currently the planning director of Montgomery County, Maryland, spent more than twenty years at the Toronto city planning department, much of it spent on contemplating public experience on the street. He prefers the sidewalk observations of urbanist William “Holly” Whyte, whose counterintuitive studies found that people actually gravitate toward sidewalk logjams. Stanley said sometimes the best approach to zoning for retail is to take no action at all. He pointed to the haphazard growth of commercial districts in Toronto’s immigrant communities. “You can hardly walk through Chinatown, but that’s what’s wonderful about it,” he said. Philadelphia is attempting to walk a fine line with a spanking new zoning law passed in December; it addresses concerns with facade details but shies away from the kind of limitations being applied in New York for fear that they would discourage reviving empty storefronts. Their new zoning law focuses instead on facade articulation and street lines. Pelli Clarke Pelli’s renovation of the retail spaces at the World Financial Center. Back in New York, developers are taking a carefully curated approach to cater to the estimated 10 million yearly tourists expected at the World Trade Center (WTC). There, about 635,000 square feet of retail will be connected within the immediate vicinity of the project. 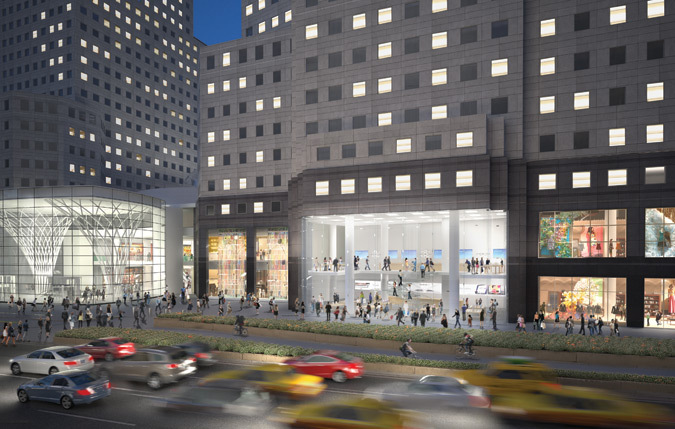 WTC’s retailer, Westfield Group, is holding their cards close, but Brookfield Properties’ vice president of leasing David Cheikin indicated that their $250 million renovation of the World Financial Center by Pelli Clarke Pelli Architects will attempt to achieve the best of both worlds, mixing luxury with local. Cheikin said the company hopes to place “the no-name designer next to the big names.” With fashion facing the World Trade Center side of the complex, locavorish delights will spill out into cafes on the Hudson River side. What Mario Batali did for Italy through Eataly, Brookfield hopes to do for New York by offering Finger Lake wines, North Fork veggies, and Hudson Valley cheeses. It’s not an exact science. Sometimes even seemingly successful local formulas like Grand Central’s Food Hall and restaurants—an example of great retail curating by a government agency, the MTA—welcome the attractive force of an established national brand. In November, Apple replaced the steakhouse Métrazur with a 23,000-square-foot showroom. The computer giant paid $5 million to get the restaurant to skedaddle and then wrangled a $180-per-square-foot deal from the MTA—less than the going rate of $200 square feet. Unlike other Grand Central retailers, Apple will not share any portion of its revenue with the MTA. This didn’t exactly sit well with established tenants. After a spate of bad press, the MTA announced that it would be seeking someone else to take over leasing 200,000 square feet of retail at the new Grimshaw-designed Fulton Transit Center near the World Trade Center, emphasizing the agency’s desire to concentrate on running transit not shops. 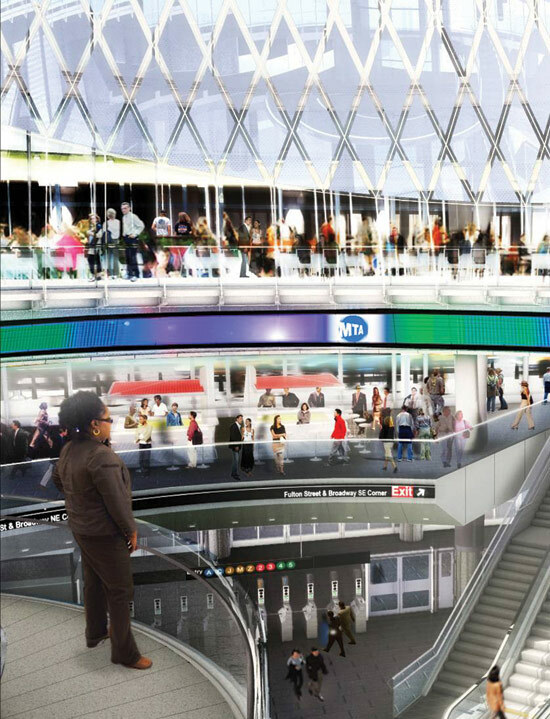 Renderings of retail at MTA’s Fulton St. Transit Station. Just a block or so from where Jane Jacobs wrote her seminal book, designer Marc Jacobs, no relation, is now holding court. The designer fills four storefronts on Bleeker Street and two more outposts sit on streets nearby. Ralph Lauren grabbed another four storefronts. High-end clothing chains take up the rest of the block, on this, the city’s latest fashion strip. The classic Village storefronts seem almost cynically preserved, like Jane Jacobs in quotation marks. On a recent unseasonably warm January night, the sidewalks were clogged with tourists. Pin spots delicately lit the haute goods. As visitors popped in and out of the narrow storefronts, few exchanges were made. Conversations with shopkeepers were limited to the product. No advice was given, none was offered, and the locals were few. There’s not a minute to lose. Log on and start clicking. 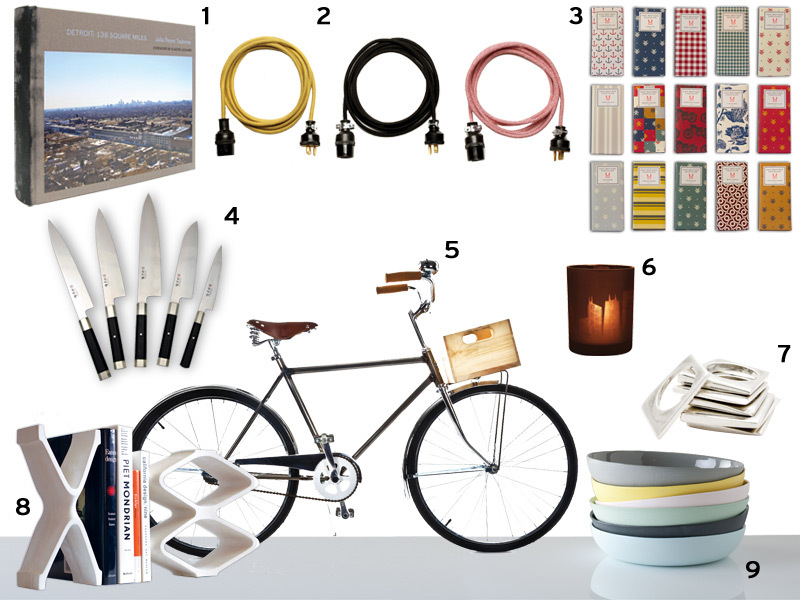 The editors of AN have preselected a full assortment of gifts—big and small, cheap and deluxe—all with that design edge and whiff of hip that your loved ones, colleagues, and clients have come to expect from you. Sharp shopping! Artfully wrapped artisinal chocolates handmade in Brooklyn. A riff on Leland’s 1964 American Cement Building facade on LA’s Wilshire Boulevard. Handmade in Detroit from recycled materials. Master the tracking shot with your iPhone or camera. 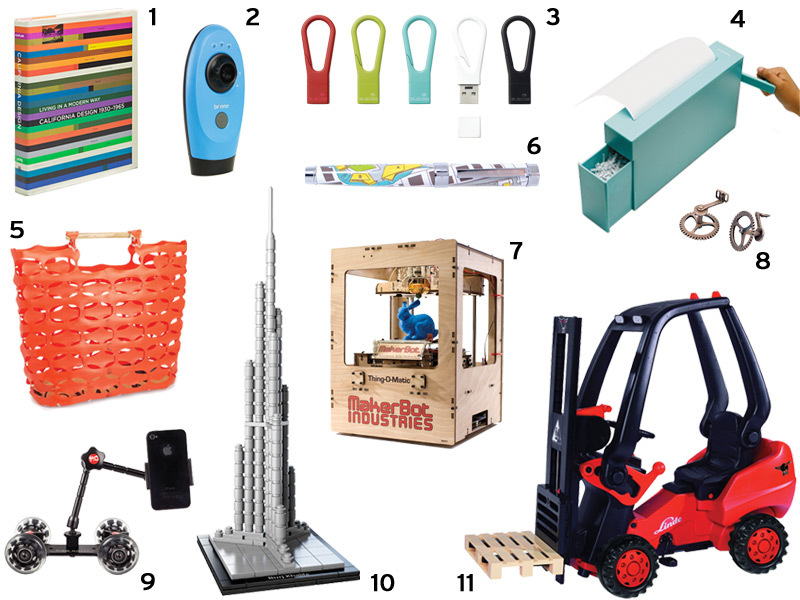 An up-lifting and pedal-powered children's toy. With a new introduction by Jason Epstein, the book’s original editor. Your old LP, like you’ve never heard it before. 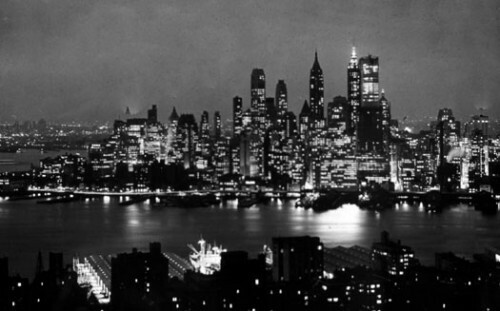 A mash-up of history and contemporary culture from longtime Harper’s editor Lewis Lapham. One in a series created in partnership with Alpha Workshops to benefit those living with HIV/AIDS. Serve mile-high drinks from the convenience of solid ground.